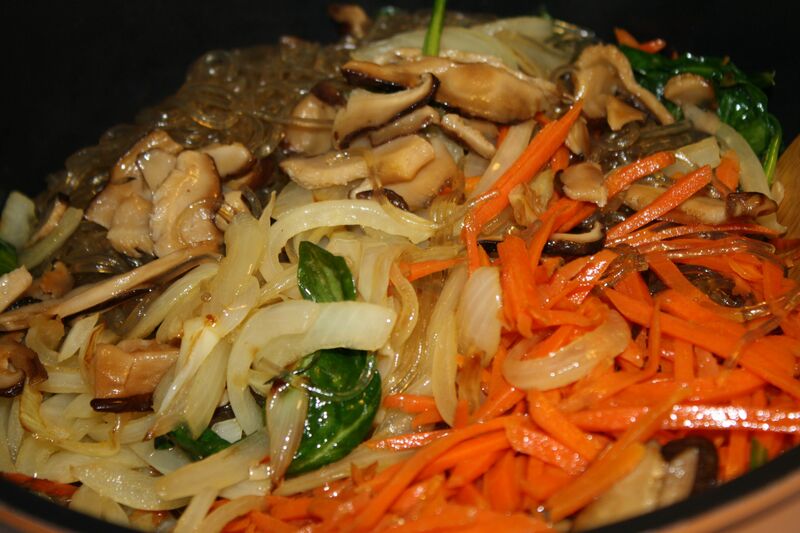 Japchae is one of Korea’s most festive dishes! Traditionally, people made this dish for community parties and family get-togethers. 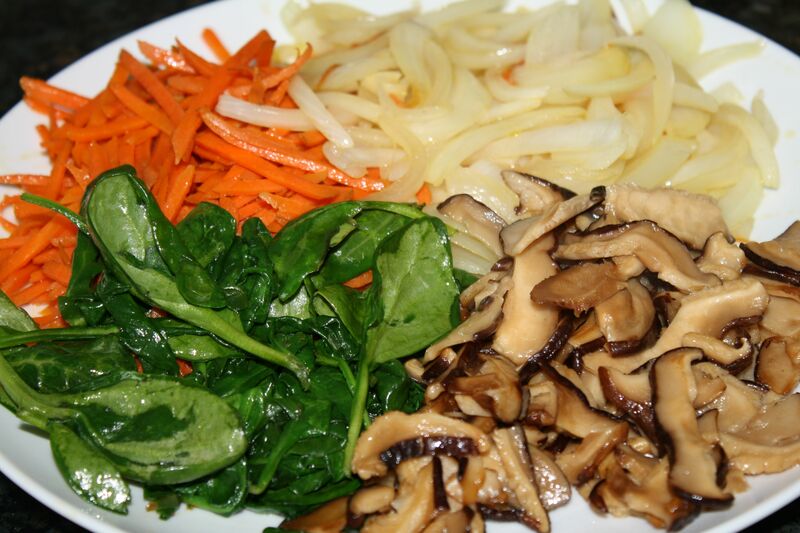 The various ingredients (Shitake mushrooms, spinach, red bell pepper, green onions, carrots, onions, etc) make the dish so colorful and delicious! 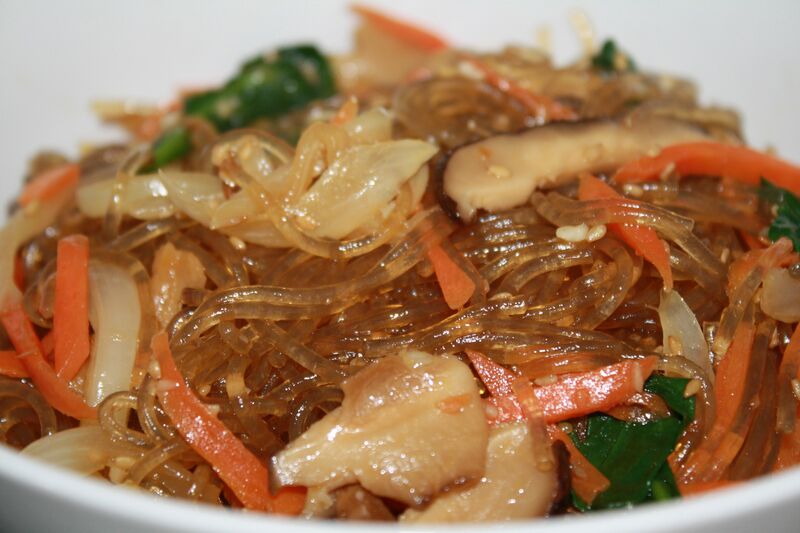 It’s made with sweet potato noodles which are healthy and yummy. It’s a very accessible Korean dish for any non-adventurous friends you might have! 1. Soak the Shitake mushrooms for several hours until soft, squeeze out water well. 2. Cut all vegetables into thin matchsticks (except the spinach). 4. Start water boiling for the noodles. 5. Stir fry the other vegetables individually with oil until soft and then remove (in other words, cook the carrots, and then remove before adding onions, and so forth). Add a sprinkle of salt each time you stir-fry a vegetable, except for the mushrooms which you will drizzle a little bit of soy sauce over. [Note the everyone cooks the vegetables to their preference. I like them soft, but some cook them so they are slightly crisp.] Remove the vegetables to a plate if your noodles haven’t finished cooking. 6. Remove the vegetables to a plate and cook the dangmyun in boiling water for 10 minutes. 7. When dangmyun is done (check if it’s soft and slightly chewy), drain well. Roughly cut into about 4 inch pieces with scissors. 8. Immediately, add soy sauce and sugar, then the dangmyun into the pan/wok and stir fry for 3-5 minutes over medium heat (this way, it will keep the noodles nice and chewy). 9. Add all the veggies to the dangmyun with garlic and black pepper. Mix well and stir fry over low heat for 5 more minutes. 10. Turn off the heat and add sesame oil and sesame seeds and mix well. Serve with rice and banchan, or just by itself! 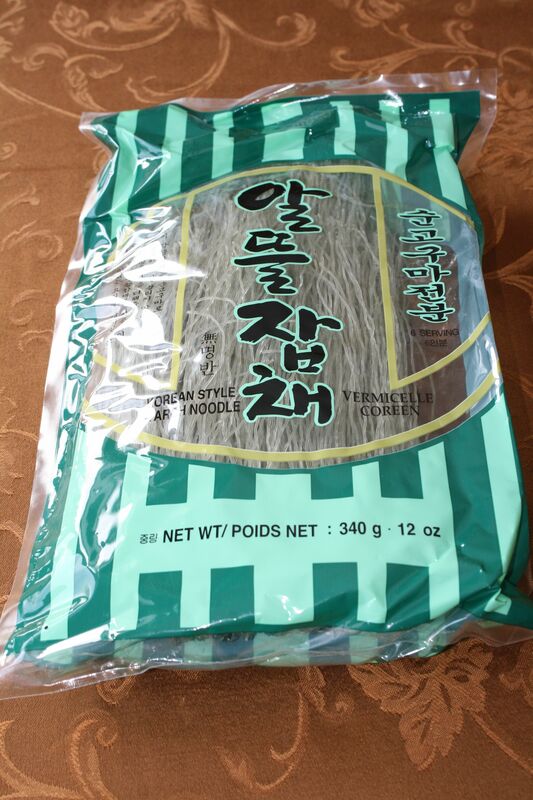 These are the sweet potato noodles that you can easily get at any Korean grocery store! Veggies and the noodles – mixing them together! We tried this recipe and love it. The sweet potato noodle is fun to eat and bouncy. 🙂 I often see these packages of the noodles in the Korean market but didn’t know how to cook it. I didn’t know that it is the glassy noodle that the market sells too. Thanks for showing the picture and the name of the noodle so I can put the two and two together. This is simple recipe but delicious. We will bring it to potlucks. Now that I know I can make it at home I won’t buy the ready-made one from the market. 🙂 Thanks for the recipe! So good! I have a hard time getting my wife to try Korean recipes, but she loved this. looks yummy,as a vegetarian i found it difficult to try korean recipes,this one is truely awesome.I have seen this noodles in stores but reluctant to buy as I was not sure about the ingredients.Sure,will try this one. Great, we hope it turns out well. Enjoy!! Thank you for the recipe! I made the dish a couple days ago and it was a hit with my husband. We loved it! I’m allergic to soy so I changed the soy sacue and used coconut aminos. It worked out well. 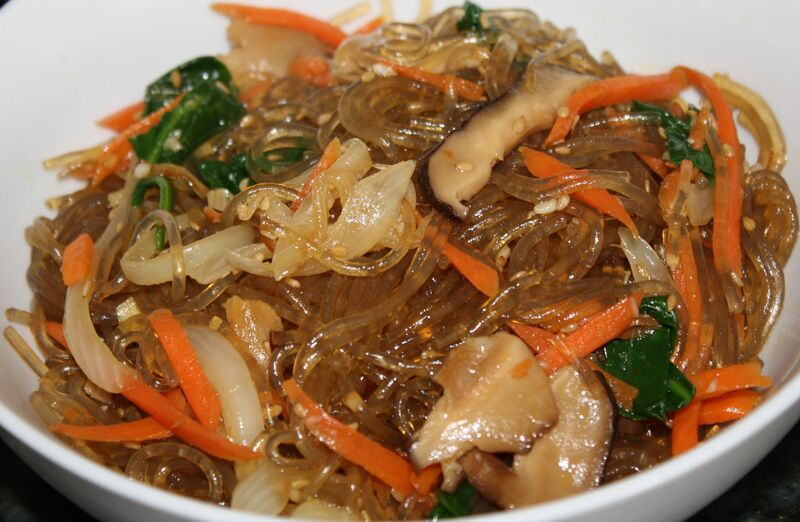 I made this last night for a group of friends who had never eaten Japchae before. One thought the noodles were a little chewy, but their plates were devoured. Good flavor and really not hard to make. Delicious. After our recent visit to Korea we have been looking for a vegan recipe. This one fit the bill. Lovely flavour. Excellent recipe, easy to make and a crowd pleaser at our home! I substituted Braggs for a lower sodium and just sprinkled on the sesame oil for a little extra flavour. Probably used more veggies too. Two thumbs up from my gang! Great, glad you liked it and hoped you enjoyed your visit! We happen to be visiting right now!